http://www.JewishWorldReview.com | Andy Ferguson, one of America's most engaging and perspicacious journalists, has not -- as Andre Malraux said of Whittaker Chambers -- returned from the hell of college admissions with empty hands. In "Crazy U," his chronicle of his son's senior year of high school -- a year of college visiting, application, essay writing, open-house attending, interviewing, financial aid seeking, and waiting, waiting, waiting -- is by turns hilarious, shrewd, and revealing. 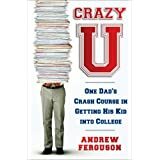 The "crazy" in the book's title refers to our national obsession with college -- a little piece of insanity to which Ferguson is more prone than most. Preoccupied by his son's prospects of being admitted to a good college, Ferguson devours advice books, college guides, and, in weak moments, websites like College Confidential, prompting this reflection about anonymous advice websites: "I'd been bewildered by [too much information] before … Before a business trip I'd go online to find a recommendation for a rodent-free hotel or a reliable restaurant. Half a dozen websites would be waiting to help … From them I learned that the local big-chain hotel was in fact a good bargain, with pleasant service and an excellent location, and also a hellhole staffed by human ferrets, with overflowing toilets and untraceable smells that had ruined the honeymoon of vox-12popula and iwantmyrum, who were now exacting their revenge by abusing the hotel on every website they could find." But along with the confusion and the profusion of contradictory advice he found on the Web and elsewhere about getting into college, Ferguson notes the dismaying effects of following the advice. He quotes an expensive "consultant" who advises "'Early on in high school your child should find a teacher they like and go that extra mile. They should … cultivate that relationship … be enthusiastic in class … and spend time outside of class with the teacher, if that's possible.'" The aim, Ferguson summarizes, is to "release" at recommendation time "a gusher of praise." In other words, Ferguson interprets, the process "turned them into Eddie Haskell . . . It guaranteed that teenagers would pursue life with a single ulterior motive . . . It coated their every undertaking in a thin lacquer of insincerity." If the process encourages a certain amount of obsequiousness and even dishonesty in America's youth, it also elicits more than a dollop of deceit by the colleges themselves. Fixated on their US News & World Report rankings, colleges "fudge" numbers like the SAT scores of incoming freshmen, the graduation rate, and average class size. Wall Street Journal reporter Steve Stecklow compared the data schools submitted to US News with the data they submitted to bond rating agencies. "(I)f they lied to a rating agency, they might go to jail; if they lied to US News they might make the Top Twenty. Reviewing credit reports for more than one hundred schools, he caught one in four fudging the numbers." Click HERE to purchase it at a 35% discount. (Sales help fund JWR.). "There was no question our hired hand thought he knew the magic words that would make an admissions committee coo: 'I would be proud to work collaboratively with diverse populations to solve problems … my readiness for greater challenges in the diverse learning environment … my enthusiasm for history, diplomacy and cultural diversity…'"
Just as gag-inducing is the spiraling cost of this four-year excursion into diversityland. The annual cost of a typical private college went from $3,663 in 1975 to $34,132 in 2009. (Many are above $50,000 now.) Ferguson analyzes it succinctly: "It's the same problem that afflicts health care (the other sector of the American economy that has seen skyrocketing costs in the past few decades), a large portion of the people consuming the services aren't paying for the service out of their own pocket. The costs are picked up by third parties." No one has the incentive to cut costs. But even paring away the layers of folly that surround the quest for college does not, in the end, disillusion Ferguson. A year's research and experience has revealed that the application process is needlessly complicated and stressful, that college admission is marred by many injustices, that college itself is perhaps a "bubble" investment that has been way oversold, and that the costs are completely unrelated to the value of the product. But when his son is accepted at the school of his choice, Ferguson and his wife rejoice. They've drunk deeply of the Kool-Aid. We all have. But after reading this hugely entertaining book, we at least see it more clearly.